Imagine a bag that does it all. A bag that’s as tough as you are, that can handle harsh environments and still look pretty good while doing it. Welcome – the duffle bag. While the duffle bag has been around for centuries, it is still underappreciated for how useful it can actually be. 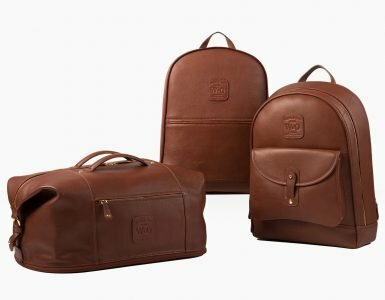 Duffle bags have cemented themselves as one of the most versatile and durable bags around, and their history will show nothing less. Originating in the town Duffel in Belgium, the bag was first used by sailors and workers. It was a reliable work bag that could weather harsh environments and demands of the trade. Thick cloth material was used to make the bag back in the 17th century. Generally, the word was used to describe a “coarse woolen cloth”, but now we know it as the duffel bag. The duffel bag vs duffle bag conundrum has created a few arguments over time. Either spelling is correct and is just as a result of how English is used in different countries. Duffel is the original spelling, but overtime duffle became more used and accepted when referring to the bag. This isn’t to be confused with the duffel coat – which is an entirely different piece for your wardrobe. The duffle bag has played its part in WWII carrying gear around the harshest of environments and then to the beaches with surfers in the golden years of the 1960’s. From basic and unassuming beginnings to their now more modern and appealing appearance, the duffle bag is still as hardworking and as durable as ever. There are many uses for a duffle bag – carrying around sports equipment, outdoor gear, clothes for a getaway, a gym bag and they are even used by sailors and military – there is no shortage of versatility. Without any difficulty, a duffle bag can change from your everyday gym companion to your overhead luggage on a flight. 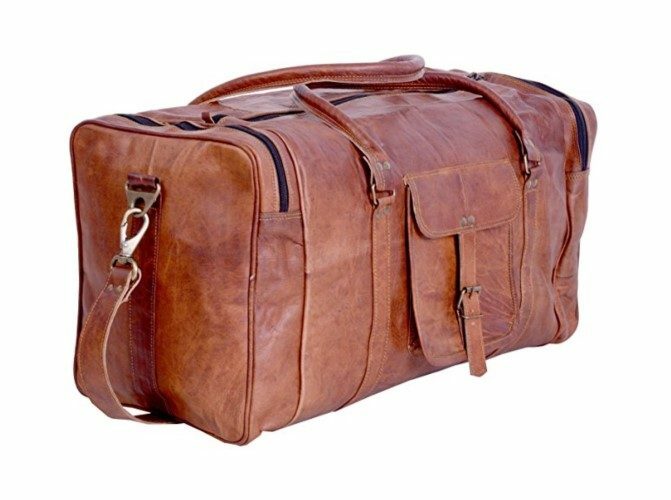 Made using genuine full grain leather, the Komal’s Passion Leather duffle bag is pure class. The inside is lined with a durable canvas for extra durability; it is not just a pretty bag. The beauty of the bag is that it can easily blend into any professional environment, but still hold its own when out on an adventure. This leather duffle bag will only look better with age as the leather wears into a new patina, keeping each memory in its grain. The 100% genuine leather and durable canvas lining gives the bag strength and durability, yet still provides a softness that is comfortable to carry. The Komal’s Passion Leather duffle bag is fairly resistant to outside environments and the additional canvas lining will keep contents safe against harsher conditions outside. The bag uses premium YKK zippers, meaning the zippers will be just as reliable and long-lasting as the hardy material used. The bag has a traditional duffle shape, featuring one large compartment that holds all the larger gear such as clothes or sporting equipment and two side pockets make room for smaller items like wallets and water bottles. The bag measures 21 x 11 s x 9 inches, which is an average/ medium size in comparison to other duffle bags. Aside from the two carry-handles, there is also an adjustable shoulder strap lets the user customize the length to suit their individual height and posture. The shoulder strap itself is also padded to help lessen the strain on the shoulder, making a more comfortable carry. Lastly, the shoulder strap is also removable, allowing you to easily clip it on or off depending on your needs. Arrives with a distinct tanned leather odor (which fades after a few days). The Komal’s Passion Leather Duffel Bag is a great, versatile bag – perfect for those going between the office, gym, and travelling. It easily fits into each environment and has room for daily gym visits or weekend getaways. The leather, canvas lining, and premium zippers give the bag a reliability and strength that not many bags can boast, and the 100% genuine leather will only look better as the bag ages. 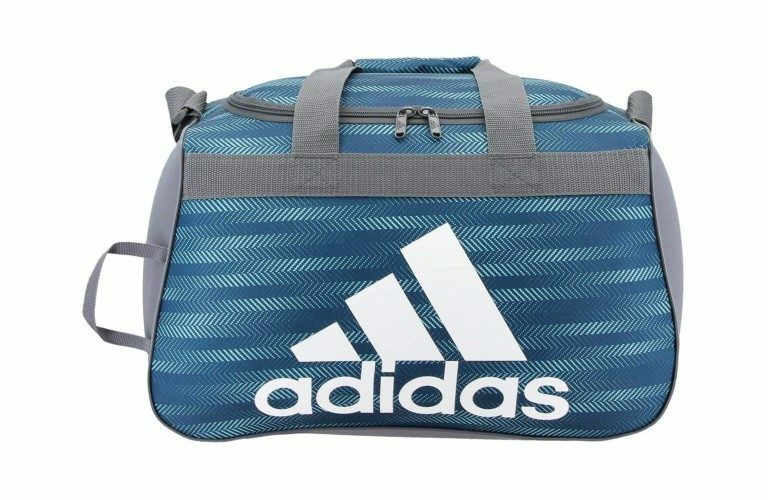 Adidas is one of the leading names in the sports scene, so it is no wonder they would have an exceptional duffel bag on offer for the active crowd. The bag is multi-purpose and is available in a wide range of colors. The simplicity of the bag is one of its biggest boasts and is all some people need. Its ability to go from the soccer field to your friend’s house is what makes it such a great buy. While it shows off more of a sporty look, it is still minimalistic enough to suit any style. The Adidas Defender II Duffel Bag is made from 100% polyester 3D ripstop. Ripstop is a fabric that is woven together to make the material resistant to tearing and damage. The bag comes with a manufacturer lifetime warranty, showing how confident they are in their own product. The Adidas Defender II Duffel Bag has a roomy main compartment that stands tall to accommodate for easy packing. The two additional zippered end pockets add some extra space for smaller items and the FreshPAK ventilated shoe tunnel caters for both wet and dry storage which is separate from other items packed in the bag. The mesh allows for the shoes to stay in an aerated compartment which comes in handy after a sweaty training session. The detachable shoulder strap is padded in both the medium and large sizes, but unfortunately not with the smaller size duffle bags. The Adidas Defender II Duffel Bag is perfect for gym goers. It comes in a wide variety of color combinations and three different sizes to cater for many individual needs. The larger bag can go from a gym bag to a weekend-away bag, and the medium size is perfect for an overnight travel bag. The smaller bag would be best suited for daily travel, still large enough to carry around your essentials. You can’t go wrong with a trusted brand like Adidas. Their logo stands bold and clear and their experience in all things sport shows through the crafting of this duffle bag. Adidas knows how to make sports bags, so it really isn’t a surprise that there are two on our list of the top ten duffle bags! 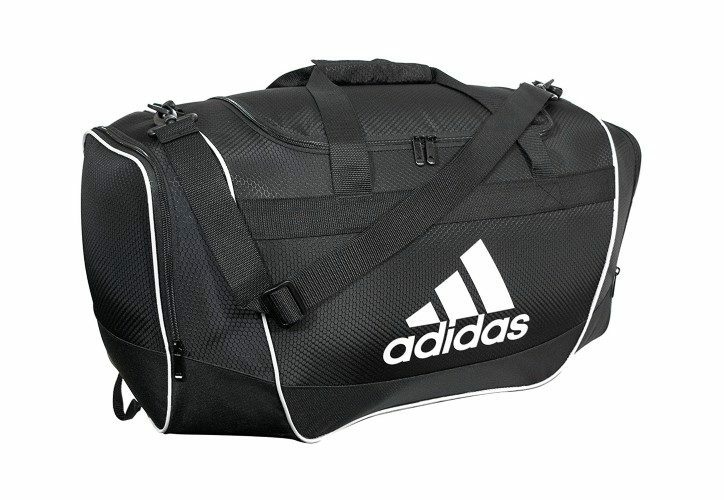 The Adidas Diablo Small Duffel Bag is a smaller, more basic version of the Adidas Defender II. Although smaller than the Defender II, don’t underestimate the capacity and versatility of this bag! For daily use, it’s the perfect size to take with you to work and hit the gym afterward. It’s also great for a weekend away and can be used as carry-on luggage when air traveling. 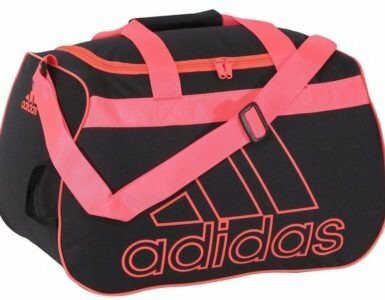 The Adidas Diablo Small Duffle Bag is made from 100% polyester. Polyester is a popular choice among sportswear as it has many benefits; it dries easily, it’s easy to wash, and it is durable. The outer material will keep your things protected and will not wear quickly due to sweaty gym clothes or dirty shoes. An Adidas logo sits boldly on the front, screen printed on. The webbing carry handles cover a main, top loading compartment that opens up easily in a D-shape. The shoulder strap is also adjustable, in order to customize the bag to a shape or size that suits you. The bag is fairly small and measures 18.5 x 11 x 10 inches, perfect for daily use. The Adidas Diablo Small Duffle Bag is compact and simple – there is not much else to it. It is perfectly fuss-free, great for the gym, daily activities or weekends away. While it might not be as large as other duffle bags available, it certainly packs a punch in terms of capacity! We love the wide variety of colors available, ensuring something to suit everyone’s taste. If you want the look of a canvas bag, but the shape and space of a duffle, then this is the bag for you! 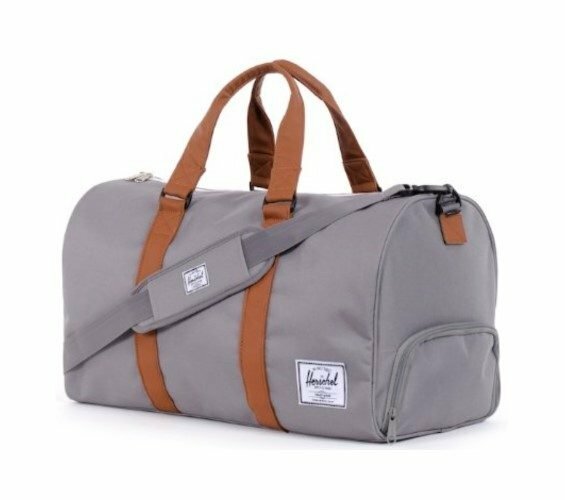 It’s traditional, canvas appeal with a washed look and contrasting straps is a more stylish and rustic take on the generic duffle bag. Giving you the freedom to glide between many different activities, the Plambag Canvas Duffel Bag is the perfect companion for both men and women. The Plambag Canvas Duffel Bag is made from 16-ounce high density 100% cotton canvas, while the interior is lined with a bronze-toned soft nylon lining. The canvas is durable, hardwearing and easy to clean. Designed to be easy to use and classy, there are elements that attest to both. The two-way zipper at the top of the bag is easy to use, while all the zippers are large in size and are smooth and comfortable to operate. Each zipper is finished with a leather pull, giving it a great vintage feel. The interior compartment can hold a laptop that is up to 15 inches in size, an iPad Air, as well as many other essentials. Aside from the main compartment, the Plambag Canvas Duffel Bag features one interior pocket, two side pockets, two front pockets and one back pocket -all with zip closures. Many pockets will ensure your items stay organized and easy to find when traveling or out and about. Something that sets the Plambag Canvas Duffel Bag aside from others is that it has two zippers on either side of the bag, which allow you to extend the length of the bag and increase its capacity. The bottom of the duffle bag is lined with four high-quality cushions as well as a film which further protects the contents of the bag. The handles are rounded for added comfort and the shoulder strap is padded, adjustable as well as removable. The Plambag Canvas Duffel Bag bag offers up convenience, comfort, and style – allowing you to take it almost everywhere you go. The multiple pockets and the ability to extend the bag gives the user enough room to pack in all their essentials and even a little bit more. Available in grey, dark grey, coffee, and army green – there’s something to match everyone’s unique style. Under Armour is a leading sports brand for good reason. Their goods are reliable, well-thought, and perfectly crafted. The Storm Undeniable II is designed to be used by sports people, but can also be used as a travel bag. The Under Armour Storm Undeniable II is made of polyester and features UA Storm technology. This means that the bag has a high water-resistant finish and the bottom and side panels are tough and abrasion resistant. In addition to the main compartment, the Storm Undeniable II features a front pocket, large side pocket with an elasticated mesh pocket over it, as well as a large vented pocket for your shoes or dirty clothing. The is also a small mesh pocket for your valuables on the inside of the bag. On the front panel of the bag, you’ll find a D-ring, which provides an additional attachment point. In total, the Storm Undeniable II measures 22 x 13 x 11 inches in size. 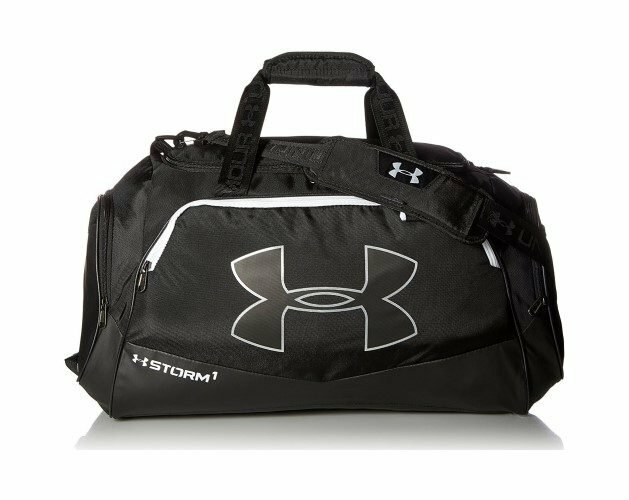 The Under Armour duffel bag is essentially an efficient, well-designed gym bag. It can be used for other sports, but can also double up as an overnight bag. The meshed pocket lets you store your dirty laundry without messing up the interior of the bag. There are more than enough colors and color combinations to ensure that there is a bag for every taste. Founded in 1964, Nike is a name that everybody knows. The Nike Brasilia 6 Duffel Bag is classy and aestheically pleasing, suitable for use as both a gym bag or weekend bag. The Brasilia 6 is made of polyester with a denier rating of 600. Essentially, the higher the denier rating, the thicker the weave, the stronger the material. 600D is the most commonly used fabric for bags and backpacks that need to withstand daily, everyday use. 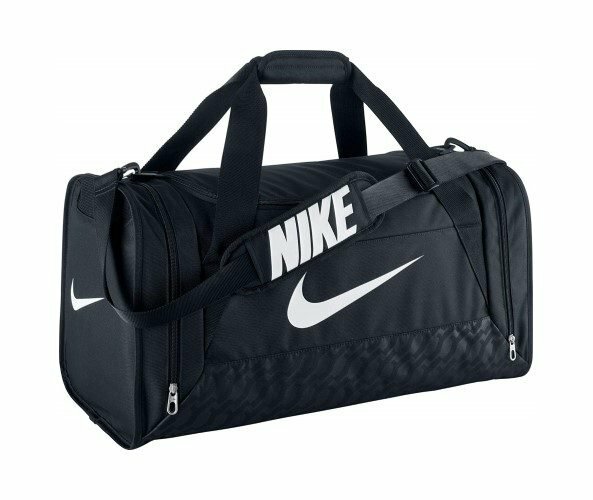 Simply designed, with the brand’s famous Swoosh logo printed on the front and side of the bag, the Nike Brasilia 6 Duffel Bag is a great everyday gym bag. Measuring 13 x 12 x 4.5 inches in size, it is also suitable for use as a weekend bag or for outdoor sporting activities. The Brasilia 6 is available in three neutral colors and features a main compartment, side pocket as well as ventilated shoe compartment. The shoulder straps are adjustable and padded for additional comfort. A limited amount of pockets/ no interior pockets. The Nike Brasilia 6 Duffel Bag is a great sports bag for those who frequent the gym often or play a lot of sports. Simple and comfortable to use, the Brasilia 6 Duffel Bag is durable, resistant to tears and looks the part in any gym. Herschel Supply Co. has captured the essence of modern necessity with their Novel duffle bag. From the gym to a quick weekend getaway, this bag has a classic style that can transition from each new adventure to the next. The exterior of the Herschel Supply Co. Novel Duffel Bag is made from a canvas-like material while the interior of the Novel features Herschel Supply Co’s signature red and white striped fabric liner. The front of the bag boasts the classic Herschel woven label. 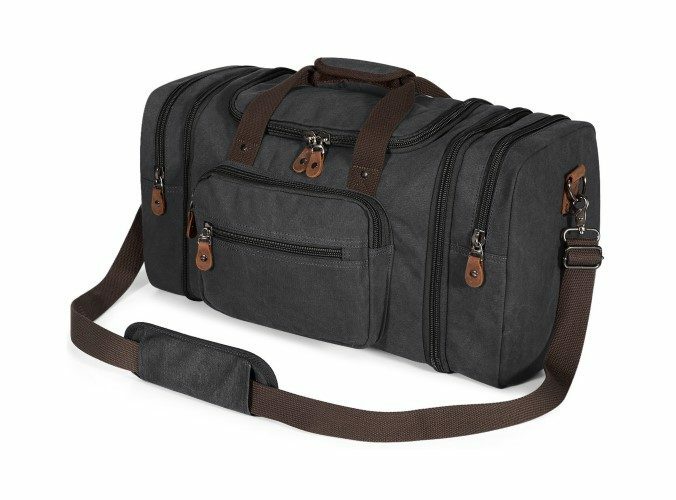 A classic but modern design, this duffle bag will make traveling easy and comfortable. Available in over thirty different designs and colors, the Novel Duffel Bag is a great addition to any wardrobe. The duffle is 20.5 x 11.5 x 11 inches in size and has a capacity of 42.5L. The Novel features a two-way waterproof zipper, carry handles with wrap-around bands, and a removable padded webbing shoulder strap. 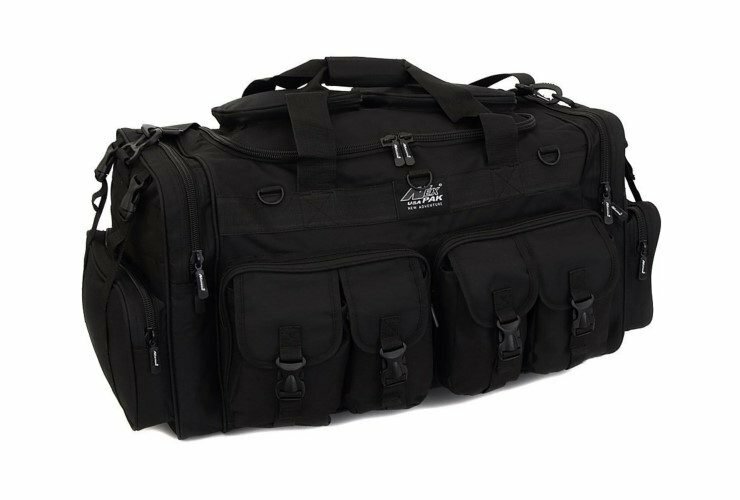 As with many of the other duffle bags, this one also features a separate shoe compartment keep your dirty shoes and laundry separate from your clean clothes. For a modern take on a traditional duffel bag, Herschel Supply nailed it. It is simple and minimalist but still offers all the comforts you need when traveling. The shoe compartment allows you to keep dirty items separate – a useful feature for those leading an active lifestyle. With such a large variety of designs/ colors to chose from, there’s bound to be something to your individual taste and style. The ultimate duffel bag! With what seems like an infinite amount of pockets, this duffle bag from NPUSA is a go-to bag for anyone needing lot’s of storage space. The NPUSA Duffle Bag is made with a durable 600D polyester and features a waterproof PVC lining, giving extra protection from the elements. A bag for the do’ers and the go-getters – the NPUSA Duffle bag offers an ample amount of space for your packing. This large duffle bag features four front buckle strap pockets, two large zippered front pockets, a U shaped opening front compartment, two zippered pockets on top of the main compartment flap and two side zippered pockets on each side. 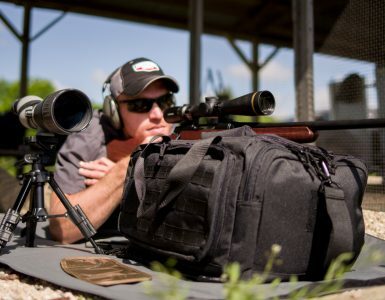 Along with the molle strap system on the sides, there are also 3 front D-rings and 2 snap load compression/hang straps on either side of the bag. The NPUSA Duffle Bag also features heavy-duty branded zippers and an adjustable, removable, and padded shoulder strap. The main handle has wrap-around Velcro strapping for easier carrying. The NPUSA duffle comes in a variety of colors/designs – black, ACU digital, camo, ACU navy digital camo, and tan. Lastly, the dimensions of this large duffle are 30 x 14 x 12 inches. The NPUSA Duffle Bag is everything you want and need in a large duffle bag. 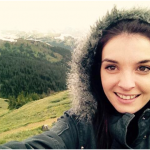 It’s perfect for those who love the outdoors, avid sportspeople, and family vacations. With such a large amount of main storage space, along with the vast amount of pockets, this duffle bag allows for total organization. The Olympia Rolling Duffle Bag was made with the travelers in mind. Not much of an outdoor bag, it was created to be light-weight and easy to maneuverer or pack away. This duffle bag is a great option for those spending their time in airports and away from home. The bag is made of a supreme “Protecflon” polyester which has an incredibly high denier rating of 1200. The bag is very durable and tear resistant, making it perfect for airport handling. The wheels are made of reinforced recessed in-line metal ball bearings which make for a smooth ride – a great bag to pull around the city or in an airport. The top U-shape opening system gives ease of access allowing you to unpack your items easily. The Olympia Rolling Duffle Bag has a hideaway pull handle that can be extended when needed, along with carry-handles for stairs or places where it cannot be rolled. Available in 20 different designs/ colors, the Olympia Rolling Duffle Bag also boasts self-repairing excel zippers and 7 exterior pockets for maximum packing space. Exceeds most airline guidelines for a carry-on when full. With a large main compartment that is easy to access, 8 additional pockets and a wheeled base, this bag will be your best friend traveling through airports and urban areas. The bold colors and designs available allow you to easily spot it on the luggage carousel too. The Olympia Rolling Duffle Bag is also a great weekend getaway bag or overnight clothes bag. 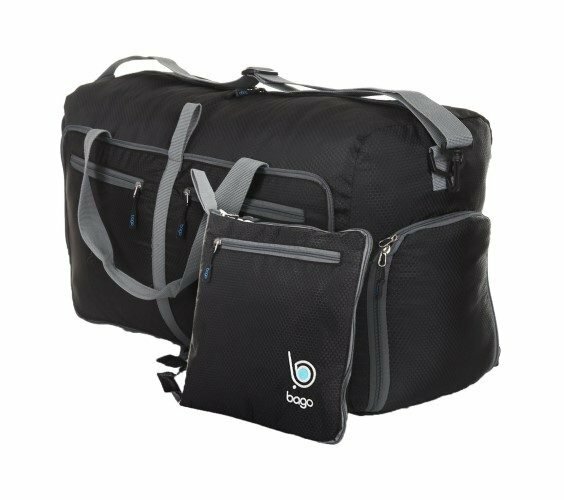 The Bago Travel Duffel Bag is the most versatile duffle bag on our list! Suitable as a gym bag, weekend bag, shopping bag, hospital bag or even as a “rescue” bag to avoid weight limits at the airport. The bag folds up into itself allowing you to fit it inside your carry bag and be prepared for anything. Made from Honeycomb Ripstop fabric, the bag is durable and resistant to tearing. The high quality corded zips will not break with regular use and are sure to keep contents safe inside. The bag is lightweight and collapsible, making it the perfect traveling companion. 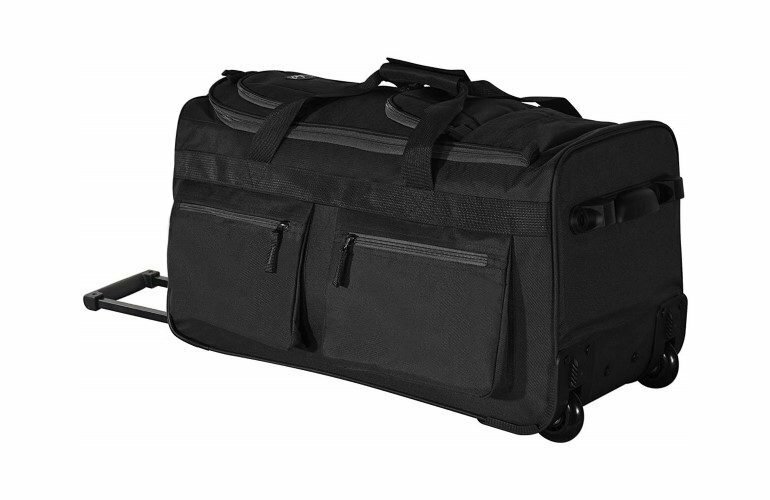 The Bago Travel Duffel Bag is 27 x 15 x 11 inches and boasts a large, 85L capacity. Once folded, it is only 12.6 x 11.8 inches in size. There are multiple pockets which can be used even while the bag is folded. The Bago features a high-quality corded zipper, 2 comfortable handle straps and a removable should strap. There is also an odor and water-resistant laundry /shoe compartment. As our most versatile options, the Bago Travel Duffel Bag is an all-rounder. Incredibly lightweight and easy to wash, it makes a great gym bag or overnight camping bag. The impressive and extremely useful feature of folding up into a compact size makes it a top choice for travelers. The separate odor controlled and water-resistant compartment lets you keep dirty shoes and laundry separate from the rest of your belongings. The Bago Travel Duffle Bag is also available in more than ten bold colors. Read through the Amazon reviews. You will be able to get a good feel for the quality of the product by reading through a few of these reviews and you’re also able to search through or add your own questions relating to the product. Take notice of the denier rating. A high denier rating means that the bag will likely be durable and resistant. Contact the manufacturer. If the bag you are buying comes with a warranty, you want to make sure that you can easily contact the manufacturer should there be any need. Emailing or getting in contact with the manufacturer with any questions you might have will be a good way to find out any missing details and information, and it will also show you how good their customer service is. 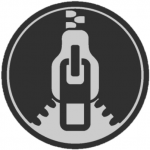 Some qualities of the bag can only be tested once used, but other factors such as the denier rating, grade of zipper and waterproofing can all be found out online. Duffel bag volumes generally range between 70-120L. The volume needed is very subjective between people, but volume is an important factor when needing to have your specific needs met (overnight clothes, work gear, camping equipment, etc). You should have a good general idea of what size bag you’re needing based on your needs. This will help narrow down your choices pretty quickly. Buying a bag that won’t fit in everything you need is a waste of time and can end up causing more trouble than its worth. You do not want to be stuck having to leave certain items behind because they don’t fit into your bag. 70-120L bags are generally used for longer trips – maybe 3-4 days at most. 90-100L is the most popular choice as they offer up adequate space for most, without being excessively big for the shorter trips. A bag that can fit into overhead storage on a plane is also a winner. Even if you don’t use it as your primary travel bag, having the option to take it on a flight with you really helps. Duffle bags are often used on the go. Between the gym and the outdoors, you don’t want to have to waste time dealing with finicky opening and closings when trying to pack or unpack your items. A D-shaped zipper duffle bag is usually easier to use than a straight line zipper as it gives you more space to work with when opening and closing the bag. The D-shaped zipper also opens up almost completely, enabling you to view all the contents of the bag. A wheeled bag with a hideaway handle will be the answer to your travel prayers. It is easy to wheel around the airport and the handle packs away to not take up too much space in the luggage compartment. Other non-wheeled duffels can be great to travel with as well if they pack away compactly. Lightweight and collapsible bags are great to take on trips, even if only as a backup bag. They hardly take up any space and can be shoved into a compartment of your main travel bag. Traditional duffle bags have one big zipper compartment, but often other smaller pockets and compartments can really helpful in keeping things organized. There is a fine line between having helpful extra pockets, and then having useless compartments that just frustrate you and take up space. The extra pockets need to be situated in a way that is easy to use and functional. They should be easy to access when the bag is full, so you don’t have to unpack just to reach your phone zipped away at the back. For active users, having mesh pockets on the outside of the bag is really helpful to keep odors and dirt away from the cleaner contents of the bag. Having a separate shoe compartment is also ideal and helps to keep the rest of your items inside the bag clean. This is a must for any gym enthusiast, hiker, or person who has a tendency to muddy shoes. A zipper can make or break a bag. A zipper that breaks or splits once there is a little bit of pressure is of no use to anyone. The placement and design of the zipper can help make the bag easy to close and easy to use. You want to be able to close your bag easily when the bag is full, and a strong zip with a good design will see to this. Look out for reliable zippers like YKK or zippers which are self-healing. There might be certain items for outdoor activities or sporting equipment that require a longer length bag to fit in. Ski poles or hockey sticks all need enough space length-wise to fit into a duffel bag. Check the length of the bag and make sure that your essential items will fit inside. When looking at the length of a bag, it is important to remember that you need to be comfortable carrying the bag too. If you are a more petite sized person, a longer bag may be uncomfortable and awkward to carry. Bags that offer the option to extend the length as needed are also extremely useful. Traditionally, duffel bags are carried by one shoulder strap or two hand straps. Now many duffel bags are wheeled and easier to transport. At the end of the day, the transportation of the bag is very personal to the owner. A wheeled bag is not going to help if you are mountaineering rocky cliffs, and a carry bag won’t be too comfortable traveling through cities and airports. For airports and normal travel, a duffel bag with wheels is the way to go. You don’t have to carry them around and bear the weight of the contents all the time, only needing to carry it on stairs or for short intervals. Rolling duffel bags aren’t all the same though, and a good duffle bag that maneuvers well depends on the width of its base (between the wheels), how rigid its frame is, and how high the handle extends above the bag. For normal day to day use, a standard duffle bag with a shoulder sling or hand straps will be adequate. Having a padded shoulder strap does also make carrying easier. If you’re needing to use your duffle bag for outdoor adventures, look out one that has extra D rings – either to attach extra straps and convert it into a backpack, or to attach additional items. The durability of the bag depends greatly on the quality of the material, the stitching, and the zipper. Most duffle bags are made with a polyurethane that is thick and resistant to water. The denier rating of the material will contest to its durability too – the denier rating relates to the thickness of the woven material and the higher the denier-rating, the more durable the material will be. Many duffle bags are lined with a nylon interior, not only does this keep the contents of the bag safe from the outside environment, but it also protects the outside of the bag from any sharp objects kept inside. While duffle bags weren’t initially built to house laptops and fragile items, many now take this into consideration with their design. Some duffel bags are built to accommodate laptops and tablets. A padded bottom lining and side walls will help keep important items such as laptops safe from bumps and scratches. Some of this padding is even removable, so you can use the duffel as your laptop bag during the day, take out the padding and hit the gym in the evening. There is no point in buying a bag that is too heavy to start with, that carrying it when full a tough task. Not only is it highly unpleasant carrying a heavy bag, but airline weight restrictions could mean you need to pack less in a heavier bag too. Wheeled duffle bags will generally weigh more due to their wheels, the structure, and also the handle. While they are great to travel with, this will take away from the number of items you’re able to pack. Finding the balance between a durable, hardwearing fabric that is also light-weight is a must. A weather resistant bag will let you take your bag into a variety of different environments, while still keeping your contents protected and safe. Whether on the back of a truck traveling to an exotic destination, or thrown into the pile of airport luggage, you want to be sure that the outside of your bag protects it’s contents. There are different materials used to create duffel bags that have different weather resistance levels. Polyester, cotton canvas, leather and Ripstop fabric are all common materials used in duffle bags. They do have different weather resistant properties though, so keep this in mind when searching for a duffle bag to suit your needs. If you are using your bag for traveling, you might not be able to be with it at all times. Having double zippers or zippers that are lockable will give you the peace of mind that your contents remain safe. There are some small locks available that fit into the double locks on bags, and they are strong enough to keep your contents safe. Coded locks are more common nowadays and are fairly easy to use, provided you don’t forget your combination. Handles depend on the type of duffel bag, and what you need the duffel bag for. Wheeled duffel bags have plastic handles that can be extended, making the bag easy to wheel around. They do also feature additional hand straps for those situations when rolling the back is not possible. Duffle bags geared more towards daily every day or outdoor-use usually have shoulder straps that can be extended to suit the users’ height. Single shoulder strap bags can often cause some shoulder or back pain when used frequently or incorrectly. A bag that has a padded shoulder strap will help alleviate some of this discomfort, and adjusting the strap to match your height will also help further. Sometime duffle bags have the option to add additional straps which convert the duffle into a backpack. Converting the duffle bag into a backpack will help distribute the weight more evenly, sharing the load across your upper back and shoulders. Most bags come with a manufacturer warranty. These can be anywhere from 6 months to “lifetime”, depending on the brand. A good quality bag will have a decent warranty period, along with good after-sales service. Having a warranty in place but a customer service that doesn’t perform is useless so make sure that you check out the efficiency and service of a brands customer service and after-sales service. Bigger brands such as Nike and Adidas have a more trusted reputation in this regard, but smaller name brands that operate from halfway across the globe may be more problematic. Searching for reviews or feedback online also gives you a good idea of what you can expect from the brand. You can always count on a disgruntled customer to leave a snarling review if they haven’t received satisfactory service. If you see more than just a handful of these, it’s likely you will have a similar experience. A duffle bag is the perfect gym companion, and can also be your best friend traveling – whether for an overnight stay or a long weekend away. Also suitable for athletes and outdoor enthusiasts, duffle bags can handle many different climates, conditions, and terrains making it as reliable as it is handy. Wheeled, carried along, with many pockets or just one large compartment – there is enough of a variety of duffle bags out in the market to ensure that you can buy one that is personalized to suit your individual needs. Making sure that the bag you choose will last for many miles and happy adventures will save you the hassle of having to replace it regularly. Every wardrobe needs a duffle bag to carry you from work to the gym or to the airport, a weekend at the lake, baseball practice, etc. From its humble beginnings in Duffel, Belgium, the versatile bag has modernized itself to suit our world and needs today, while still being as durable, hard-wearing and as useful as it was all those years ago. The duffle bag has been around for its fair share of time, and thanks to it’s versatility it’s sure to be around for the next few centuries too.